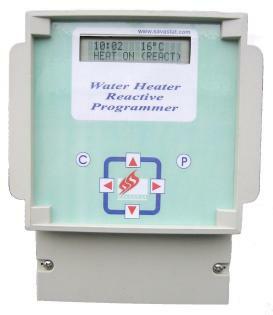 Most Direct Fired Water heaters are not connected to the mains supply via time clocks. This is usually due to the belief that they provide a well insulated source of hot water which is under regular demand. The truth is, they are regularly firing to maintain their set point temperature and little or no demand is made for the majority of their ‘duty’ time. The Savastat Sensormatic DHW provides a time clock facility with a reactive module which will bring the system back into service should the integrated sensor detect a drop in stored temperature or immediate need. The service parameters are user-configurable but the unit is supplied with factory default settings which will suit most situations. Reductions of fuel use often exceed 20% providing rapid return on investment. The Savastat modular programmable controller is an electronic water heater control designed to optimize the fuel efficient operation of gas and electric water heaters. The unit is set up with four time periods mirroring the expected main water demand. During the timed periods the water heater operates in normal mode. Outside the pre-set time periods the unit is switched off and in ‘reactive’ mode constantly monitoring the hot water temperature. When stored water temperature decays or is lowered by an unexpected load to the pre-set ‘reactive temperature’ the unit will re-activate the heater, for a pre-set ‘reactive time’. During this time period the thermostat on the appliance will take over as normal. An anti-cycling period is preprogrammed within the unit that will not allow a gas fired water heater to re-fire within five minutes of the burner shutting down. Also, optional settings to control boiler sequencing allow for bringing each unit on-line at preset intervals, when managing multiple units. All operational parameters are controlled and changed via the soft touch buttons. The LCD readout confirms all modes and settings and displays the units status. Data input is password protected.